This is a great product. Clean, straight and ready to paint. Treated with “Light organic solvent preservatives” which makes it resistant to termites and decay. It is suitable for outdoor use. But, not in ground use. It comes in sizes from 18x18 to 230x18 in stock. Also 30x30, 42x42, 66x30 up to 280x42 and many in between. All sizes come in 5.4m lengths. But, like fascia 185x32 and 230x32 you can get it up to 7.2m long. 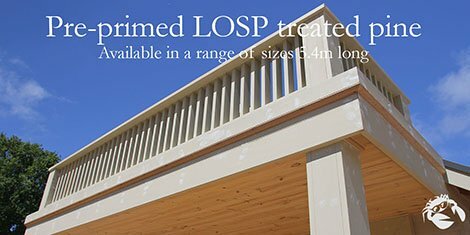 Perfect for balustrades, weather board stops (for Baltic primed weather boards), trims under eves, handrails, the list goes on. Contact us or come in to see the full range of sizes.